On Tuesday, we got to be a part of ESPN’s College Basketball marathon – our men’s basketball team played against Northern Iowa in the 8am time slot. The administration of the university were really supportive about encouraging students and faculty to attend the game if possible, and it was a really fun way to start a work day!! We packed up ourselves and Peanut and braved the cold on the walk into the coliseum. As usual when toting around my purse plus the baby bag, I opted for our convenient little point & shoot camera rather than my good camera. Sometimes the light weight weighs the most in the packing process! Prior to tip off, they showcased the new banners from last year’s amazing season. It was a great way to kick things off and recognize what a great job our team did last year. It really felt like a family affair with all three of us there, and as an added bonus, my dad made the drive up early that morning to go to the game with us! 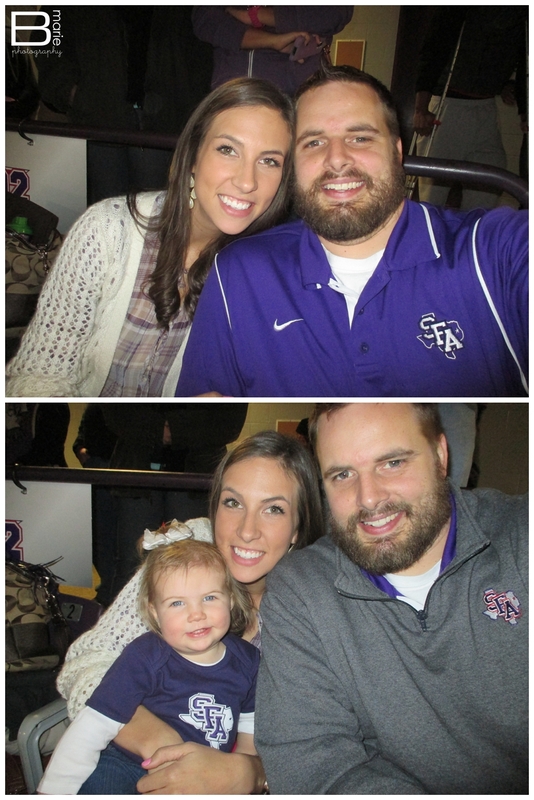 Like I mentioned about going to the SFA volleyball games, the two of us used to regularly attend the basketball games together, so it was a treat to have him come to the game as well. So this one’s a biiiiit too close, and a little blurry… but seriously, how cute is she??? The poor thing ended up wearing herself out… she fell asleep just as the game went into overtime. Apparently charming everyone in the coliseum is tiring work! The game didn’t end up how we hoped it would, but it was a great effort from our guys. A very stressful entertaining game for sure, and I think ESPN is probably pretty happy with their choice to include this one in the tv marathon. Hopefully we catch a lot more games this season – and maybe Peanut will end up awake to see the clock run out next time! « Time to Practice What I Preach!